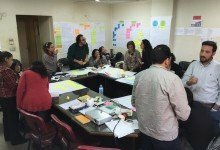 The reform programme at Caritas Egypt is aimed at at strengthening the organisation and its people, to make it more sustainable and its work more visible in the world. The programme was designed and is implemented by Perspectivity Enterprise. The programme kicked off in the Fall of 2015. Mission & vision workshop to sharpening the shared vision, mission, values and principles for the entire organisation. Communication strategy workshop to identify current skills and communication practices and to develop a shared communication agenda, including a short-term action planning for collaborative execution. Living the vision and mission workshops in various regional offices, to familiarise the staff there with Caritas’ sharpened vision, mission, values and principles. Organisational structure workshop to identify weaknesses in the current structure and design a new organizational chart that enables mutually reinforcing departments that create collective impact in communities. Short cycle communication scrum workshops and various work sessions to create the basic communication infrastructure together. Activities are ongoing and will continue in 2016.